Definition at line 12 of file adler32.c. Definition at line 20 of file adler32.c. Definition at line 19 of file adler32.c. Definition at line 57 of file adler32.c. Definition at line 58 of file adler32.c. Definition at line 59 of file adler32.c. Definition at line 13 of file adler32.c. Definition at line 134 of file adler32.c. Referenced by deflate(), deflateResetKeep(), deflateSetDictionary(), inflate(), inflateSetDictionary(), and read_buf(). Definition at line 172 of file adler32.c. Definition at line 180 of file adler32.c. Definition at line 143 of file adler32.c. 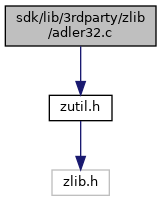 Referenced by adler32_combine(), and adler32_combine64(). Definition at line 63 of file adler32.c.